I visited Berlin again this time with my classmate way back during my I.S. days in MCFI and her family and some friends. 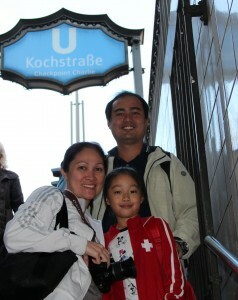 Last time I was in Berlin, was with my niece Duday. It was a first for both of us. For her, the first time she travelled from Brussels alone via the ICE going to Frankfurt am Main then further on to Berlin with me. For me, the first time to visit Berlin, the capital city. We stayed two nights at one of the Hotels in Potsdamerplatz. We had a really nice time. For her, perhaps tiring, but anyway educational. That was in August last year. Two weeks ago, I went back there with some friends. It was also tiring since we tried to squeezed as much place as we could visit in one day. Anyway, I hope they enjoyed it as much as I did. I got to spend sometime with Bong. Got to know her a bit more. Caught up with her life’s ventures… as wife, mother and a career woman all rolled into one. The Bong that I used to know is totally different now. I can’t imagine her being the successful Realty Broker and over protective mom of Sophie. You see, before, I thought Bong was a softie. Although a really beautiful personality inside, I thought that she was the type who would need someone to protect her. Someone to provide everything for her. I never thought that she would turn out to be a very independent, very reliable sophisticated woman like she is now… to top it all… successful in her chosen field of career. My hats off to you Bong and it was really nice to see you again. Last time we were together in Zürich was 6 years ago. I hope it will not take that long till we see each other again. Hopefully, Mike and I can visit you and Leonick in your Villa in Antipolo next time we come home to visit.